Being well prepared for the SATs is key to helping your child feel calm and confident so they can do their best in the tests. But what can you do at home, and outside of school, to support them and help them feel ready? 1. Create a regular revision routine. Build a schedule that’s flexible and easy to manage, with bite-sized chunks of revision time. A revision diary or calendar can help plan when to revise and which subjects to focus on. Find the best time for your child and your family’s schedule and avoid moments when they (or you) are tired. 2. Little and often? Or longer sessions? Some children like short, sharp study sessions of 15-20 minutes each day, while others like a marathon of one or two hours. 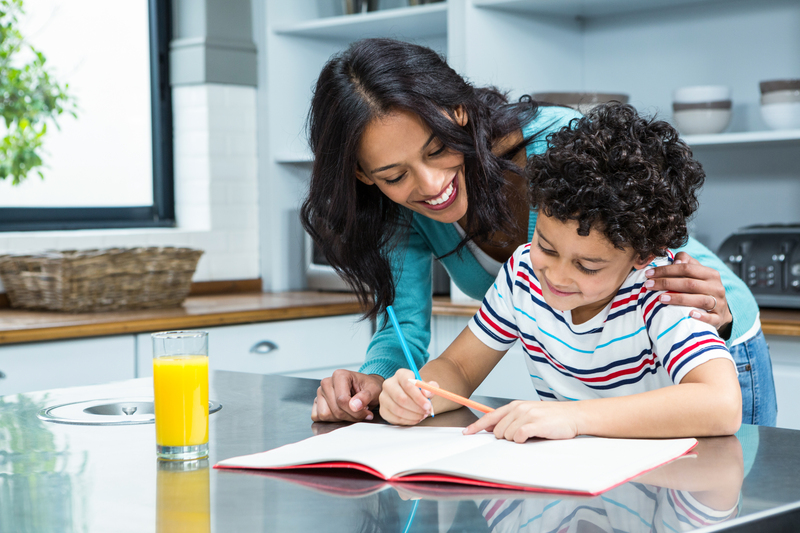 Find out what suits your child best and choose a quiet place in the house to revise, away from noise and distraction. Relax on household chores and use the prospect of a treat to motivate your child and reward their achievements – perhaps a special meal, snack or extra football time, or an afternoon out with friends. Children are very motivated by praise, so be sure to celebrate what they are good at! Split it into chunks! Get plenty of teacher support to target weaker areas where extra help is needed. Find out what’s worrying your child. Perhaps it’s verbs on the Grammar, Punctuation and Spelling paper. Or reading to find information on the Reading paper. Use your revision diary to note down any areas to work on and when you will cover them. Our Study Guides are great resources to target one aspect at a time with inbuilt SATs practice to target and teach exactly what is needed for SATs success. Your child will have a set time to complete the tests, so building up to this with our 3-Step Test Booster in either Reading or Grammar, Punctuation and Spelling will not only help motivate children to track and see how well they are doing but also build ‘test resilience’ as they progress from quick 10 minute, then 15 and finally 30 minute tests. 6. Combine independence with support. It’s good to work together with your child to complete some tasks, practising answering questions, thinking out loud to emphasise ‘how’ you reached the answer. But after a short time together, step away so your child can have a go on their own as they need to develop their independence and confidence. The answers in the back of our Study Guides are perfect to help you here. 7. Record and track their progress. What scores are they getting? Make a chart or write them in your diary or calendar. Our 3-Step Test Boosters provide a useful progress chart and our Study Guides for Reading and Grammar, Punctuation and Spelling also promote self-assessment so children can see how they’re progressing and what they’ve achieved. 8. Rehearse the types of questions. Your child will face a number of different question types – multiple choice, tick the box, ranking/ordering, matching or write an answer – and it’s important that they’re familiar with what’s expected and how to answer them, so be sure they get plenty of practice for each. The York Notes KS2 Catch Up Reading book is great for taking your child through all the different question types and the 2-minute tests and quick quizzes in the Complete Revision and Test Practice book will help consolidate their skills. 9. Test technique tips – in a nutshell. Read the question carefully and think. What is it the question asking? Practise checking that the correct number of boxes are ticked. If the question asks for two boxes to be ticked, then two must be ticked. Practise clear, consistent and correct punctuation. Make sure capital letters are used correctly and in the right place. Practise making any corrections or crossings-out clear. Encourage your child not to waste too much time on a really difficult question and to go back and have another go at any that were tricky. Practise reading skills like skimming and scanning to help your child quickly get the gist of a question, and reading more deeply if necessary. Help your child understand when it’s necessary to summarise, visualise, or highlight important words and phrases. Use a variety of guides, past papers and homework tasks and combine formal revision and practice sessions with fun tasks and practical learning activities when you’re out and about. Don’t forget reading for fun! Variety will keep your child interested and alert. Above all, give your child plenty of praise, support and encouragement. Preparing for the SATs is a positive opportunity for your child to demonstrate how well they can complete tests and show off what they know and can achieve. It’s also a great time for you to help them feel ready, confident and positive about moving to secondary school. You can buy York Notes for KS2 English SATs from www.yorknotes.com, Amazon or your favourite bookstore. Janet Thompson is an experienced English Specialist Leader in Education (SLE) and currently a primary school class teacher who also provides high quality, engaging literacy, reading and spelling support for parents and teachers.